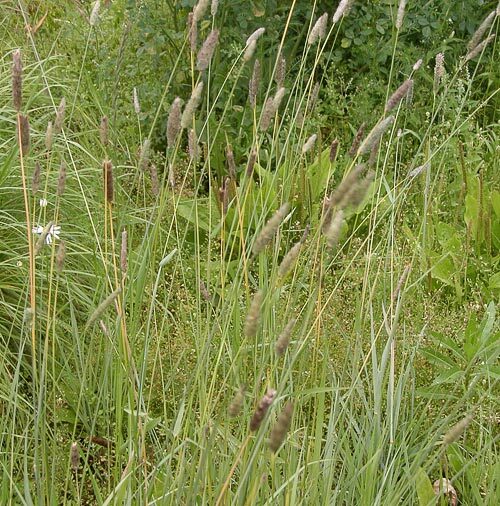 AgroAtlas - Crops - Alopecurus pratensis L. - Meadow foxtail. Alopecurus pratensis L. - Meadow foxtail. Family Poaceae Barnhart., genus Alopecurus L.
Alopecurus songaricus (Schenk) V. Petrov, Alopecurus laxiflorus Ovcz. 2n = 28. A long-lived, tufted perennial grass, robust, hairless (except spikelets), rhizomatous. Stems erect, 80 - 120 cm high. Leaf blade rolled when young, large (3 - 7 mm), quite coarse, dark green. Ligule of average size, variable, truncated, oblique at the base (cheek the junction blade-sheath on the lower side of the leaf). No auricles. Spike-like, cylindrical inflorescence, narrowed to a fairly sharp point at the top, hairy-silky, dark green to black. Spikelets 1-flowered. Glumes united in the lower third, lengthily ciliate on the back. Lemma awned. The weight of 1000 seeds is 0.50 to 0.70 g (average seed). Flowering - May-June, seed ripening- June-July. Cross-pollinated by wind. Introduced into culture from the end of XVIII century. Cultivated on relatively small squares in the forest area at 39 regions and republics of former USSR countries. Five breeding cultivars have the state permission for utilization. Is not distributed wide because of difficulties with seed production. Mesophyte. Adapted to cool, moist temperate climates, very resistant to cold, but will also withstand high summer temperatures. Grows best on deep, moist, fertile soils. It will withstand flooding by fresh or brackish water. It is not drought resistant. Thrives on cool and wet soils. Optimum on nutrient rich to very rich soils. Grows on slightly acid to alkaline soils. Widespread mainly on clay soils. Other types of soils can be suitable as far as they are wet and nutrient rich: alluvium, colluvium and peat soils. Primarily cultivated as a meadow or pasture grass; where adapted it produces over a long grazing season. Widely used as a hay grass for wetlands. Quite palatable as pasture or hay. Plants produce an open turf and a dense sod in older stands. As pasture, it is often seeded with Big trefoil or Ladino clover. Seed rate with legumes alone is 15-28 kg/ha. However, when sown in combination with legumes (Lotus corniculatus, Trifolium repens or T. hybridum) and with suitable grasses, as Festuca pratensis or Phleum pratense sown at rate of 2-6 kg/ha. Growth starts early in spring and continues throughout the summer if moisture is sufficient. It remains green in winter and will continue to make growth, provided the temperatures are not too low. The fluffy seeds make machine seeding difficult. Hay of good quality may be harvested if cut early. Aftermath growth is good. Forage mass productivity ranges from 15-30 MT/ha, hay productivity ranges 4,5-7,5 MT/ha and seed productivity is 150-400 kg/ha. Catalog of state permitted cultivars of agricultural crops. 1969. - M.: Kolos, 489 pp. (in Russian). Catalog of state permitted cultivars of agricultural crops. 1971. - M.: Kolos, 488 pp. (in Russian). Catalog of state permitted cultivars of agricultural crops. 1974. - M.: Kolos, 480 pp. (in Russian). Catalog of state permitted cultivars of agricultural crops. 1985. - M.: Kolos, Vol 3. - 489 pp. (in Russian). Catalog of agricultural crops. cultivars permitted in Byelorussia. 1985. - Minsk: Uradjai, 176 pp. (in Russian). Golovkin B. N. 1988. Cultigenic plant area. - M.: Nauka, 184 pp. (in Russian). Medvedev P. F., Smetannikova A. I. The forage crops of European part of the USSR. 1981. - L.: Kolos, 336 pp. (in Russian). Shashko D. N. Agroclimatic region of the USSR. 1967. - M.: Kolos, 335 pp. (in Russian). Shashko D. N. Agroclimatic resources of the USSR. 1985. - M.: Kolos, 248 pp. (in Russian). Soil resources of the USSR (Agricultural regions of areas and republics of USSR). 1990. - M.: - Vol 1. - 260 pp. (in Russian). State register of Ukrainian plant cultivars. 1992. - Kiev: Urojai, 199 pp. (in Russian). State register of breeding achievements permitted for utilization. Plant cultivars. 1994. - M.: - 218 pp. (in Russian). State register of breeding achievements permitted for utilization. Plant cultivars. 1996. - M.: - 171 pp. (in Russian). State register of breeding achievements permitted for utilization. Plant cultivars. 1999. - M.: - 192 pp. (in Russian). State register of breeding achievements permitted for utilization. Plant cultivars. 2000. - M.: - 232 pp. (in Russian). State register of breeding achievements permitted for utilization. Plant cultivars. 2001. - M.: - 252 pp. (in Russian). State register of breeding achievements permitted for utilization. Plant cultivars. 2003. - M.: - 236 pp. (in Russian). The Natural-agricultural regions and utilization of soil resources of the USSR. A. N. Kashtanov (ed.). 1983. - M.: Kolos, 336 pp. (in Russian). The register of plant cultivars in Ukraine. 1996. - Kiev: Urojai, 259 pp. (in Russian). Copyright on the photos belong to Dzyubenko N. I.